I'm still blogging with my laptop from my sick bed. Good times! Like most viruses I catch, my body's plan of attack is to simply kick back let the virus ravage me until it gets bored and leaves on its own. I fear if I don't get better soon, I won't have my St. Patrick's Day dessert finished in time and then I will get emails from disappointed readers (like I did for Pi Day). For the record the lack of a Pi day post was not an oversight, I was just too sick to get any cooking done this weekend. Besides, everyday is Pi Day at Not So Humble Pie! We don't need a special day around here to engage in baking nerdery. So today's treat: Chocolate Covered Espresso Bean Ice Cream. I got a hold of a huge bag of chocolate covered espresso beans in bulk last week and naturally they were involved in the ice cream making spree. I took my favorite super-rich chocolate ice cream recipe, from Fran's Pure Chocolate cookbook, tarted it up with a little instant espresso powder and the chopped chocolate beans. Of course I have nearly 10lbs of the beans left over and as much as Mr. Humble insists that he can eat them all, I think I need to find another use for them. If anyone knows of a good recipe that includes chocolate covered espresso beans, do send them my way. I would be most grateful. In a large heavy-bottomed sauce pan, whisk together the cocoa powder and half of the sugar. Pour in a half cup of the milk and whisk together for a couple minutes until a smooth paste forms. Add the remaining milk and the heavy cream, whisking well and place the pot over medium-low heat. Cook, stirring frequently for about 10 minutes. Don't let the mixture come to a simmer or a boil, you simply want to cook the dry raw taste out of the cocoa powder. Once the mixture has the smoother flavor of cooked chocolate, remove from the heat. In a bowl, whisk together the remaining sugar with the egg yolks. Temper the eggs with 1 1/2 cups of the warm chocolate-cream mixture, stirring constantly. Pour the tempered mixture back into the pot with the remaining chocolate-cream, stirring constantly and set over low heat. Cook, stirring constantly until the mixture coats the back of a wooden spoon (roughly 160°F). Remove from heat and add the chopped semisweet chocolate. Allow the mixture to stand for a minute and then stir until smooth. Add the espresso powder and vanilla and mix. You can then refrigerate this mixture, with a coating of plastic wrap pressed down onto the cream so a skin doesn't form, for about an hour until chilled. Then it is ready to be added to your ice cream maker. However, if you're impatient like myself, you can pour the mixture into a stainless steel bowl sitting in an ice bath and stir occasionally until the mixture is chilled (10-15 minutes) and add to your ice cream maker. Freeze the mixture in an ice cream maker according to the manufacturer's instructions. Add the chopped espresso beans to the mixture during the last five minutes of mixing. Pour the mixture into an air tight container and freeze for at least an hour until firm. Chocolate just takes on an extra delicious dimension with the addition of coffee. So you missed Pi day -- that's okay...Mole day is June 2...I can see a whole lot of creativity with that time frame stretching out ahead of you. I'm afraid they're best as garnishes. I can't imagine that the texture of crunching coffee beans works in anything other than ice cream. Of course, I'm like Mr. Humble and would eat all ten pounds as-is, if they were available. How strong is the coffee flavor in the ice cream with one tablespoon? I need to use two to get a good coffee flavor in my chocolate espresso cookies, but only a half when I want to boost the chocolate without coffee flavor. That looks incredible! Get well soon. I HAVE AN IDEA FOR YOU!!! I made double chocolate biscotti a few weeks ago and it was delicious!! LOVE IT! I wish I had an ice cream maker so that I could make this recipe - it sounds wonderful. There is nothing I love more than chocolate and espresso! How would chocolate covered espresso beans taste in a traditional chocolate chip cookie recipe? They could replace the choc chips and would work nicely with the sugary cookie. PS on Pi Day. One time in 7th grade, my now 18 year old daughter took 2 pumpkin pies to school to celebrate Pi Day. Her Math teacher put them in the teacher's lounge for safe keeping. Before their Math class could even enjoy them,one of the PE teachers came in the teacher's lounge and devoured almost an entire pie. She never forgave him and remembers the event every March 14. Curses to Pi Day. mmm. i might have to try this one and all for me! my own container of dark chocolate covered beans sit in my desk drawer here at work. good for an afternoon pick-me-up. Yummm! Biscotti and chocolate chip cookies do sound good. 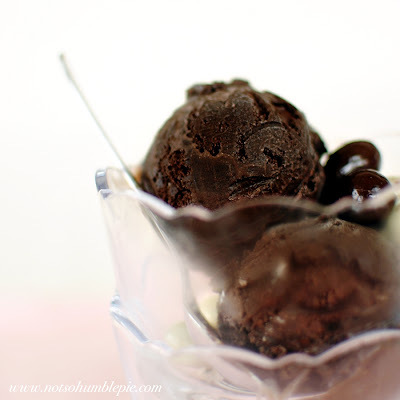 As for the ice cream's flavor with one tablespoon of espresso powder, that amount provides a good balance between chocolate and coffee for a quart of ice cream (particularly with the addition of the chocolate covered coffee beans). Of course, you can always add more or less to taste before pouring it into your ice cream maker. They're not exactly seasonal at this point, but around Christmas I always whip up some "Peppermint Latte cookies" aka chocolate chip cookies w/ crushed choc covered espresso beans mixed in, and crushed candy canes on top. I really love the deep, dark brown these scoops are. My mind reels with topping possibilities! This ice cream looks too good to be true. I love how dark it is. YUM! Oh my god. Want this so badly. It looks so dark. Like actual espresso. But it also sounds like it would kill: chocolate, cocoa, eggs, milk AND cream. You need to eat lots of this to fight that virus! ACTUALLY, Pi day really isn't until 3.14.15! Feel better! I made licorice ice cream last week too, Mjau. Only I used Aussie licorice. I should of used dutch (The Aussie type has too strong of a molasses flavor) because the stuff I used just isn't licorice-y enough. Just for fun, with one batch I should use that salty, ammonia edged dutch licorice. Wouldn't that make for an 'interesting' dessert! I've thrown them into brownies but my fav is a bit of vanilla ice cream, milk, beans & whirl away. A damn fine milkshake!!! This sounds SO good! Any excuse to pair chocolate and espresso. Wow...so much chocolate and coffee..I can feel the caffeine buzz radiating from my computer screen! This soudns delish, bet the taste is so rich. Hope you get better soon!! Thats sounds intense - And delicious! Possibly the yummiest-sounding morsel I've seen on your blog yet! And that's even taking the macarons into account!